Simple and sweet. Sea-foam and Silver. This handmade paper bracelet is elasticated. Based in Eldoret, Kenya, Imani Workshops was established in 2005 under the social enterprise wing of the Academic Model for Providing Access to Healthcare (AMPATH). AMPATH was created in response to the challenge of providing life-saving care in the face of the HIV pandemic in Kenya. AMPATH now treats over 60,000 HIV-positive persons, with almost 2,000 new patients being enrolled each month at over 500 clinical sites throughout western Kenya. 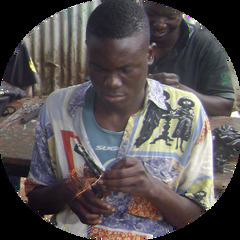 Imani Workshops is a fair trade, social enterprise created to provide hope and sustainable income opportunities for HIV+ and disabled persons. Along with medical services provided by AMPATH, Imani artisans are provided skills training and employment opportunities that give them and their children an avenue to rebuild their lives economically and socially.